Yesterday was a marathon of cooking, cleaning, and candy making. All to recreate a dessert I enjoyed while in London. I admit it requires some effort to make all the components from scratch, but is was worth it. Honeycomb ice cream is awesome. Or, as it is called in New Zealand, Hokey Pokey. Over in my neck of the woods, the Hokey Pokey is a dance for the young and uncoordinated. I think I prefer the ice cream version as, unlike the dance, there are few embarrassing memories associated with the ice cream. For anyone unfamiliar with honeycomb or hokey pokey ice cream, it contains bits of a light airy toffee. This gives the ice cream a wonderful caramel crunch. With the cookies and a drizzle of caramel sauce, it is even better. So today's dessert is made up of four parts. If making each component from scratch seems overwhelming, that's okay. Even writing out the instructions for all this seems a little overwhelming. So, do feel free to substitute danish butter cookies, store bought caramel sauce or even good quality vanilla ice cream. After all, you can always sprinkle the candy on top of your scoops. You can also pace yourself and make some of the components in advance. The butter cookie dough can be kept chilled or frozen before slicing and baking and the caramel keeps well in the refrigerator. Some recipes for this candy use a lot of of honey. However all that fructose will make the candy hopelessly hygroscopic (it will absorb a ton of moisture from the air and turn quickly into a sticky mess). The amount of honey called for here isn't much, but it provides a good balance of flavor for the candy-chemistry trade-offs. It won't turn to goo and you'll still be able to smell the warm honey throughout the cooking process and you will taste it when you are finished. Ready a heat safe pan with a little nonstick spray. Combine the sugar, honey, light corn syrup and water in a large heavy bottomed sauce pan. Cook over medium-low heat, stirring constantly until the mixture comes to a boil. Once boiling stop stirring and wash down the sides of the pot with a damp pastry brush. Continue to cook over medium-low heat until the sugar begins to caramelize (turn a light blond color). Cook until it darkens just a little bit (a light gold color). Watch it carefully, if it gets too dark your candy will be bitter. Add the baking soda and mix quickly using a whisk. The candy is going to foam up and triple in volume. Working quickly, pour the fluffy mixture into your prepared pan. Allow it to cool completely before breaking and storing in an air tight container. In a medium saucepan, combine the milk, sugar, 1 cup (250ml) of the cream and the salt. Place the pan over medium heat. Cook until very warm but not boiling. Add the seeds of the vanilla bean and the bean itself to the pot. Cover and remove from heat. Allow the mixture to steep at room temperature for 30 minutes. Whisk the 6 egg yolks together in a medium bowl. Slowly pour the warm milk mixture into the egg yolks, whisking constantly. Pour the mixture back into the medium sauce pan and place over medium heat. Stir the mixture constantly, scraping the bottom, until the custard thickens and coats the back of a spoon. Strain the custard through a mesh strainer and add the remaining cream. Stir in the vanilla extract. Pick the vanilla bean out of the strainer and return it to the custard. Place this bowl into an ice bath and stir until cool. Cover and chill the mixture in the fridge until very cold. When you are ready to churn, remove the vanilla bean. Add the mixture to your ice cream maker and chill according to the manufacturer's instructions. In the last few minutes of churning, add the honey comb. When finished spoon the ice-cream into a storage container and freeze until solid. In the bowl of your stand mixer with the paddle attachment, cream the butter sugar and salt until light and fluffy. Scrape down the sides of the bowl and add the egg yolk and vanilla, beating until combined. Stop the mixer, add the flour and then mix on low speed until the flour is completely moistened and the dough comes together in a ball. Turn the dough out onto a piece of waxed paper or parchment paper. Form into a foot-long log. Wrap in the paper and then flatten with a rolling pin until it is roughly 1/2"-3/4" thick. Chill the dough until firm. When firm and ready to bake, preheat your oven to 325°F. Pour the turbinado sugar onto a small plate and set aside. Unwrap the dough from the parchment and using a sharp knife cut 1/4" thick slices from the log. Dip one side of the cookies into the sugar and place, sugar side up, onto a parchment lined cookie sheet. Bake the cookies for 15-20 minutes until golden brown. Allow to cool completely on a wire rack. To assemble the dessert... does this really require instructions? Anyway, warm the caramel sauce in the microwave (or gently on the stove top). Scoop the ice cream, drizzle with caramel and serve with the butter cookies. Oh wow! I've had honeycomb candy before, but it's really hard to find around here. I know what I'm going to be doing with my day off tomorrow. Thanks for posting this recipe - the whole thing sounds delicious. The first batch of ice cream I made in my ice cream maker was Hokey Pokey. It was the primary reason I bought an ice cream maker. I had Hokey Pokey when I was in New Zealand and since it isn't available in the U.S., I knew I would have to re-create it. I did exactly what you did using the David Lebovitz recipe and everyone who has made it says it tastes exactly like what they remember from New Zealand. I will have to try making the Hokey Pokey candy with Honey instead of Golden Syrup, I didn't know that would work. I always have a hard time finding Golden Syrup. 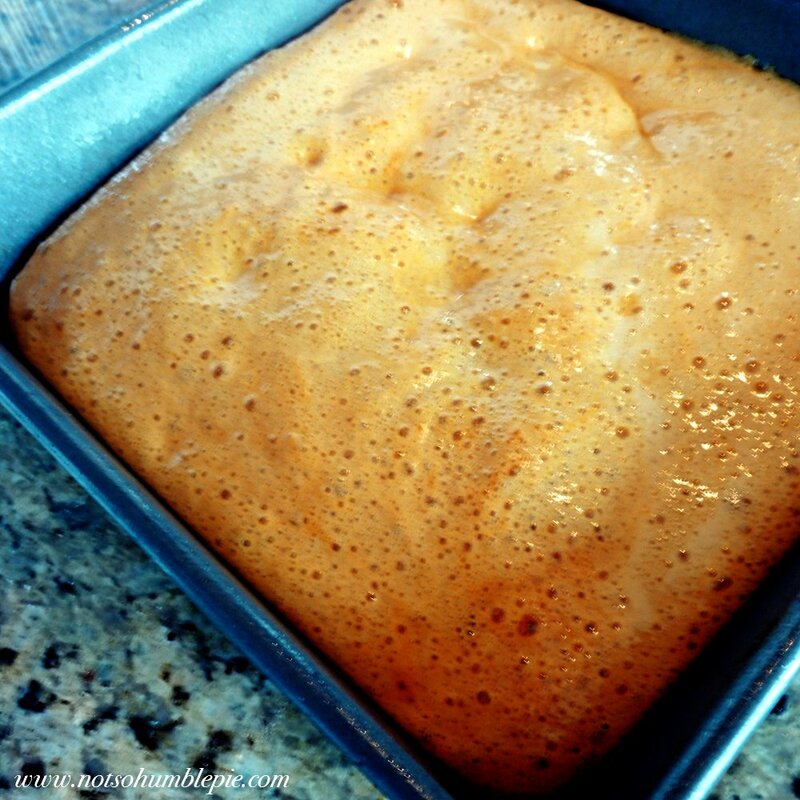 You can use honey, molasses, golden syrup, corn syrup or invert syrup. All will work, they just produce some variation in the final flavor of the toffee. I wish golden syrup was easier to find around here too. This looks divine! I must try it soon!! AND how do you keep your oven so clean!? You are amazing! It really isn't clean. The bottom is full of ash, I ran a self clean cycle earlier this week and still haven't cleaned it out completely. "yields enough to make your dentist send me hate mail"
Are you kidding? You've just bought her new Cadillac. Is the honeycomb candy the same thing as the interior of a Crunchy Bar? Oh, I love the photo of the caramel sauce spilled over the small bowl. Lovely! This ice cream looks amazing. Dimi, yes. This candy is made all over. Though it is called different things and there is a little variation in the ingredients, it is essentially the same type of candy. Crunchie bars, honeycomb, hokey pokey, sea foam candy, angel food candy, sponge candy/toffee...I'm sure there are other names for it too. Oh, my teeth hurt just reading this . . . but my stomach is growling. I think I'll go buy an ice cream maker this weekend. Oh My!!! So want some of that tonight! Going to have to whip out the ice cream maker soon!! Thank you for posting! Oh WOW! that looks yummy! Too bad my pans and ice cream maker are all on a boat to Malawi. I will have to try and remember to try this once we are there. If you ever wondered how us British got our global reputation for dodgy teeth it's 'cause we were all brought up on this stuff. I have to admit I have never had the pleasure of having honeycomb ice cream, but I am so glad to find it here on your blog. It looks amazing. Totally worth all the step required, I'm certain! Looks great. I need to break out my ice cream maker! his sounds absolutely divine. Honeycomb is my favourite ice cream but I just can't find it any more! I did try an Irn-Bru while in Scotland last month. I mean really, it is hard to miss the bright day-glow-orange bottles. The taste though, how does one describe the flavor of Irn-Bru? I've been having trouble explaining it to others. It is mind boggling. I always wondered how honeycomb/cinder toffee was made! I was a childhood treat for me, mum used to but some when we went to the local market. Made two batches today. The first completely refused to come out of the dish so I had to soak it out. The second time I poured it into a silicone dish (actually, silicone cake cases, but same idea). Didn't even bother with the non-stick spray and it was really easy to take out. And since there's no oil, I didn't even need to wash the silicone after!